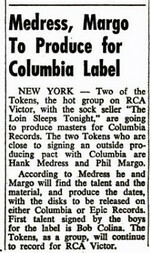 The earlier A & R deal with Columbia isn't mentioned but do check out Artie Wayne's interview with Hank Medress for Spectropop in which Hank talks about The Tokens deal with Capitol Records for 5 singles and recalls in great detail meeting the Chiffons and their manager & song writer Ronnie Mack in one of Capitol's office and the subsequent recording session, a must read. Capitol Records turned down The Chiffons "He's So Fine" and ended their A & R deal. The Tokens had recorded the track with money from their demo budget supplied from the publishing company. So off they went to get the cut pressed with another label. All the majors and most of the minor record labels turned them down before Laurie Records clutched the cut to their bosom and Bright Tunes took The Chiffons to Number 0ne in Billboard's pop and soul charts. For the rest of 1963 the hits just kept a'coming. No wonder as soon as their recording contract with RCA was up they had set up their own B.T. Puppy Record label, it must have all seemed so easy! Of course they knew it wouldn't be but for creative types the chance to have control over what they recorded must have seemed irresistible. 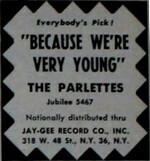 They were given an early warning of the type of problems they may have to face when less than a year after taking the Chiffons to the top of the heap, attorney Seymour Barish president of Bright Tunes, after receiving a letter from Stan Allen the personal manager of The Four Seasons, charged The Chiffons with a breach of contract and warned Vee Jay Records that to affect a breach in this contract would have serious financial repercussions. In a move that didn't appear to help either side The Chiffons 'won' their court fight but stayed with Laurie Records and to a lesser degree the musical direction of The Tokens. With the start of B.T. Puppy most of The Tokens productions except of course for The Chiffons were for there own label until they signed to Warner Bros. They were though approached to produce for artists signed to other labels and as with all their mid-sixties productions the quality was exceptional. *2 Both sides of this 45rpm are credited as written by G. Sappir-E. Brandon. The same recording of "If I Had A Hammer" but in stereo and correctly credited to Seeger-Hays was also released as by The Town Criers on their "From Shore To Shore" album (B. T. Puppy 1009) in 1970. *3 These cuts aren't actually credited but both cuts on this 45 are accepted as being produced by The Tokens during their Capitol tenure. Hank Medress noted that The Tokens deal with Capitol Records was for 5 singles, unless there is another 45 out there this would seem to confirm the two Revlons cuts on Crystal Ball were produced by The Tokens. *4 Patrick G. has already added two releases to The Tokens discography and I was delighted to receive another email with another addition recently. Quite a bit harder finding this one and I've copied his research below. Thanks Patrick. "While searching through copyright records on Copyright.gov I made a series of discoveries that led me to believe the following record is a Tokens production from when they had the production deal with Capitol in 1962, Discogs.com. Both 'Little Man' and 'Just Another Date' are songs published by Bright Tunes Music in 1962, both written by Alan Harvey. And I came across the following website on Google that claims the Galaxies recorded these plus an additional one on February 27, 1962 in New York for Capitol, Popculture Fanboy Blogspot. I think it’s reasonable to assume that the Tokens produced the session, one of the their first for their new deal with Capitol Records." *1 Billboard chart No. 1, 6th April 1963. Billboard R & B Chart No. 1, 6th April 1963. *2 Both sides are instrumentals. *3 Billboard chart No. 10, 24th August 1963. Flip is instrumental. *4 Billboard chart No. 67, 13th July 1963. Later releases add Bert Berns, name to the writer credits. Some promo copies list Margo-Medress-Siegel as writers. *5 Billboard chart No. 5, 13th July 1963. Billboard R & B Chart No. 6, 13th July 1963. *6 Billboard chart No. 45, 31st August 1963. Ronnie Grossman is aka Neil Sedaka. *7 Billboard chart No. 40, 19th October 1963. *8 "Say There" was also released on The Satans Four & The Cinnamon Angels "Mixed Soul" album (BTP/S 1010). The same recording but in Stereo. The Del Satins recorded for B. T. Puppy as The Satans Four, so does that mean The Wonders are also The Del Satins? It is strange that it should be included on the LP but I don't think so. I'd guess The Tokens just thought it was too good a track not to re-use. *9 Later released on Rust 5072. *10 Billboard chart No. 105, 23rd November 1963. Flip is instrumental. *11 Billboard chart No. 36, 4th January 1964. *12 Billboard chart No. 97, 21st December 1963. Naturally the LP is known by it's lead track and chart topper "He's So Fine" but the album is simply called "The Chiffons". 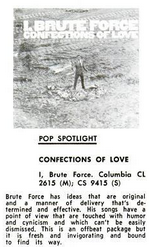 (Brute Force) Did You Ever Go Steady? *2 Billboard chart No. 81, 15th August 1964. *3 Billboard chart No. 133, 19th December 1964. *4 Accordingly to the sister of the lead vocalist this 45 was planned to be released on B.T. Puppy. I'm not sure why it wasn't or why it was released on what I guess is a Laurie subsidiary label. The Tokens provided the backing vocals. *5 Afraid all the 1965 record release dates are very approximate. A-side production credit actually reads "A Bright-Tunes 'Cave Sound' Production"
*6 Also issued with "The Real Thing" (V.Simpson-N.Ashford-J.Armstead), Engineered by Bob Arnold on the flip-side. *7 Billboard chart No. 85, 8th October 1966. *8 Billboard chart No. 10, 25th June 1966. *9 Billboard chart No. 67, 27th August 1966. *10 Billboard chart No. 117, 3rd December 1966. *11 Billboard chart No. 149, August 1966. Album shown is on UK London, re-issued after "Sweet Talkin' Guy" charted at No. 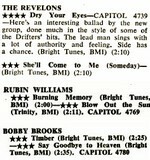 4 on the UK charts in 1972. *12 I can't recall where I first read of one of the most sought after girl group rarities The Cookies "Mr. Cupid" / "Hang My Head And Cry" (Warner Bros 7047), think it may have been on J. D. Doyle's want list from the 70s. However as can be seen from the label scan, correct titles (and producers) but wrong artist, it is in fact recorded by The Big Guys. *13 The A-side flip "A Love For All Seasons" has no credited Tokens involvement. *14 The Next Exit were aka The Fabulous Four, not as has been claimed The Tokens. Full story here on Garage Hangover The Fabulous Four - Next Exit. *15 Only a few promo copies of this 45 were issued in the UK. "George Harrison, Living In The Material World" by Olivia Harrison reveals that George hired eleven string musicians from the London Philharmonic Orchestra to play on "The King Of Fuh" and he edited the final mix. *16 This group is aka The Sundae Train. Only promo copies, with the same song on both sides, are known to exist. I assume Dave Appell brought the group to The Tokens attention, previous to the B.T. Puppy and Avco releases Dave Appell co-produced The Sundae Train's "I Wanna Be" / "Wake Up (Sleepy Girl)" (20th Century 6693). (Possible!) Sixties Productions un-released at the time. (J. Powell,E. Navarro) Clifton 13 64? (?) Crystal Ball 107 64? *4 The Chiffons "He's A Bad One"
*5 The Chiffons "Soft Spoken Guy"
Available as a YouTube video 67? *6 Various Artists The Tokens, The Happenings, The Chiffons, Dusty Springfield, The Yardbirds, Spencer Davis Group, The Who and Blues Magoos. "Great Shakes" Commercial. First releases of Tokens compositions not produced by the group. 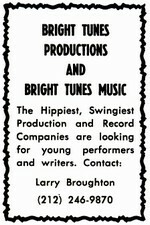 First releases of Bright Tunes compositions not produced by the group. *17 Dean Randolph "It's All Your Fault" (), "She Knows I'm True" () The Dean Of Philly CD Crystal Ball 1092 64? *1 The Doo-Wop Blogg notes that most of The Dahills 45s were produced by The Tokens. However the only 45 issued at the time of recording, "Michelle" / "Why Do We Have To Say Goodnight" (Musicor 1041)'64, was produced and arranged by Alan Lorber. None of these tracks recorded in the 60s but not released until the 70s have a producer credit. 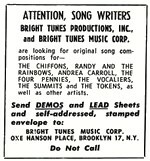 "She's My Angel" the Randy & the Rainbows song and "Do You Want To Go Steady" published by Bright Tunes have a confirmed Tokens connection. Whilst "Please Be My Girlfriend" and "I Who Love You" share the same rocking mid-sixties doo-wop feel that the Tokens captured so well. File under most likely produced by The Tokens but either way all are well worth a listen. *2 The sleeve notes to this CD list "Take It Like A Man" as being the only un-released track from the groups Laurie Records tenure but then notes that the previously un-released "Angel Face" was recorded March '64. *3 Not released on Laurie until 1976. *4 First released on a UK Ace Records subsidiary label in 1985 the songwriter's were later identified and its 1967 production date noted in the credits to Stateside double CD "Sweet Talkin' Girls - The Best Of The Chiffons". No producers are listed on the CD and if the '67 production date is correct this may not be produced by the Tokens but well worth a listen all the same! *5 No writers, producer or date information supplied but go to The Chiffons - Soft Spoken Guy (YouTube Video) and give it a listen. I suppose it could be a late recording but although not a 'classic' cut it sure sounds like it's from the sixties and Bright Tunes time period. Three productions I'm fairly sure, The Chiffons, The Happenings and The Tokens and it would be cool to know if they had any 'hands on' involvement with the other artists. Also included are 2 bonus cuts Stone Poney's jingle for Pepsi and Troggs for H.I.S. 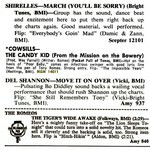 *7 The Tokens did produce "March" for Beverly Warren and The Chiffons but The Shirelles was the first version released. *8 This LP also includes a version of the Greenwich, Barry, Tokens written song "I Have A Boyfriend". *9 The 'writer' H. Jamiph was earlier identified on this site as being H.(Hank) Ja(y)mi(tch)ph(il) = The Tokens. I'm assuming the 't' in H. Jamith is a mis-printed 'p'. *10 The Tokens version was later released on their and The Happenings "Back To Back" LP. *11 Also released in March by Billy Harner (Parkway 950), arr by Leroy Glover, prod Wes Farrell and in May by Tom Burt (Cameo 363) prod & arr Dave Appell. The Billy Harner release, well at least my copy has the publishing credits on the wrong sides. *12 The Tokens recorded both these cuts, released on their "It's A Happening World" album. 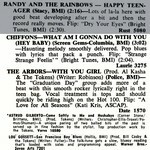 "Grey City Day" was also cut later by Denny Belline on RCA 9041, prod by Andy Wiswell. While I'm on the Tokens Warner Bros. LP, another cover version that may be of interst is The Young Americans "Sunset See My Sadness" on ABC 10998, prod Anita Kerr. *13 Later released by Bob Miranda, the writer on B.T. Puppy 544. *14 Alright, I know The Tokens released the original version on their "It's A Happening World" album the month before The Soulful Bowlful but what's a few weeks amongst friend? UK group The Creation covered the track, produced by Shel Talmy and first released in '68 as a 45 in Germany. *15 Worth noting The Other Voices, Ellie Greenwich and Mike Rashkow's produced cover of "No Olympian Heights". *16 As mentioned earlier The Tokens supplied backing vocals on most of their productions, so these are not noted. If there is male backing on any of their productions it's most probably a Token or two/three or even four. When they weren't working on their own recordings they were often helping friends on theirs. Hardly any documentation for backing vocalists so this list can really only be taken as a guide to artists they backed on record. It would be interesting to hear folk's guesses as to b-vox but I'd really need confirmation before the track would be included on this list. *17 Ed Engel provides the info on his Crystal Ball CD for The Tokens vocal backing on these recordings, possible productions also. *18 'Ronnie Michaels' contacted the Flower Bomb Songs website. *19 The Tokens also backed Keith's on his earlier 45 (Mercury 72596) "Ain't Gonna Lie". *20 Warren told me that The Tokens backed him on this and most of his recordings. *21 Interviewed by Mike Dugo for his website 60sgaragebands.com group leader "Teddy" Dewart recalled "We used the Tokens on every song that required a male chorus." *22 Love this, a sort of answer song, great fun, so good it wouldn't suprise me if The Tokens helped out. *23 The Billy Jo Producer credit stands for Billy (Carl(ucci) of and The Essentials) & Jo(seph John Venneri). Flips a goodie also. Keeping in The Tokens mode the same producing team, with the addition of Sammy Lowe as arranger, also released a 'tokenish cover' version of Kornfeld & Duboff's "Don't Cry (Sing Along With The Music)" as Billy & The Essentials. *24 Love this, a very different arrangement but still doesn't give the label a right not to credit the writers! *25 A very sympathetic cover of The Tokens W. Bros cut. Gerard is Gerrard Kenny, a well known, especially in England song writer.